One of The Conan Doyle Estate’s latest licence's is the new Holmes and Watson film starring Will Ferrell and John C. Reilly. One of the Conan Doyle Estate’s latest licences is with Sony Columbia for the new Holmes and Watson film starring Will Ferrell and John C. Reilly. We catch up with Screen Rant to get the latest word on the street and catch a glimpse of the new trailer! 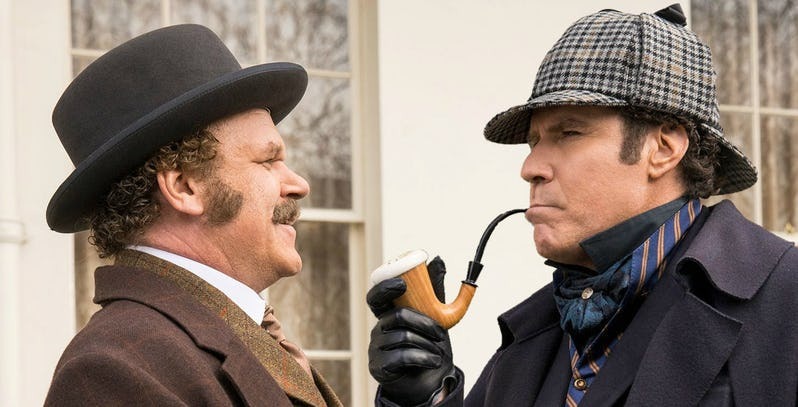 The Holmes and Watson reunites Will Ferrell and John C. Reilly for a comedic take on Sherlock Holmes. Ferrell and Reilly previously collaborated with director Adam McKay on a pair of films in the 2000s; namely, the 2006 NASCAR parody Talladega Nights: The Ballad of Ricky Bobby and their 2008 movie Step Brothers (a comedy about two middle-aged men who still live with their parents). The duo were generally applauded for having great onscreen comedic chemistry and there’s been talk of them reuniting on a project like Step Brothers 2 over the decade since. With a Step Brothers sequel unlikely to happen at this stage, Ferrell and Reilly have instead re-teamed for a funny variation on Sir Arthur Conan Doyle’s Sherlock Holmes detective stories. The project has been in development for ten years and originally had Sacha Baron Cohen attached to star as Holmes opposite Ferrell as Dr. Watson. Obviously, a lot has changed since then and Ferrell is now portraying “the world’s greatest consulting detective” himself, with Reilly costarring as “his loyal biographer” Dr. John Watson (as the official synopsis describes them). With just a few months left before the film hits theaters, Sony has officially begun its marketing campaign for Holmes and Watson. Ferrell and Reilly are joined here by a cast that would be just as impressive (perhaps even more so) even if this were a straightforward take on the Sherlock Holmes mythology. Their ranks include Ralph Fiennes as the villainous Professor Moriarty, Hugh Laurie as Sherlock’s brother Mycroft Holmes and Kelly Macdonald as Rose Hudson, Sherlock’s landlady. Other key players include Rebecca Hall as Dr. Grace Hart, the first female doctor in London; Lauren Lapkus (Jurassic World) as Millie, a woman able to match wits with Sherlock intellectually; and Rob Brydon (The Trip) as the ever-slow-to-keep-up Inspector Lestrade. Holmes and Watson was written and directed by Etan Cohen, who previously collaborated with Ferrell on the 2015 comedy Get Hard. That film paired the latter with Kevin Hart, but didn’t go over so well with critics and was generally dismissed for being a waste of an interesting premise and leading (funny) men. Cohen might have more luck during his second time at bat though, what with Ferrell and Reilly having already proven themselves to be an entertaining comedy team. At the very least, the Holmes and Watson trailer suggests the combination of its stars’ “dumb” humor and the world of Sherlock Holmes alone should provide some easy laughs. Whether Holmes and Watson will succeed at the box office, however, is another matter. The film is set to open directly against four other major wide releases this December (Aquaman, Bumblebee, Welcome to Marwen and Alita: Battle Angel) and will arrive just two days after Disney’s sequel Mary Poppins Returns hits the scene as well. Then again, Ferrell’s comedy Daddy’s Home became a hit despite having to compete against Star Wars: The Force Awakens over the same frame three years ago, so there may be hope yet for Holmes and Watson, in that regard.